EXPOMAQ is the oldest exhibition of machine tools and various industrial manufacturing equipment in Mexico and Central and South America, which started in 1996, has been held annually since 1998, the year 2018 is the 22nd of EXPOMAQ. The main service areas include: automotive manufacturing, aerospace manufacturing, energy source, medical equipment manufacturing, household electric appliances, electronic equipment, etc. The venue of the exhibition – Monterrey of New Leon, located in northern Mexico, adjacent to the United States, the most important industrial production center in Mexico. Most automotive and automotive parts production plants, such as engines, chassis, tires are located here, as well as steel industry, electronics industry, cement industry and glass industry. Although the scale of the exhibition is rather small, the crowds and inquiries are rather high. Whether agents, traders and users, had a good progress here. 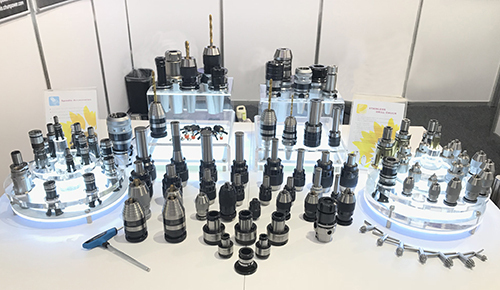 About the popularity of machine precision accessor, most belongs to Tool Holder series, especially CAT40–ER32 Tool Holder series is the most popular; about the specifications used in Mexico area, with CAT Tool Holder series as the main, BT Tool Holder series as secondary, other specifications are rarely used. We are recruiting Mexican agents, please to click here to contact us.